Who doesn’t want to receive some presents? Who doesn’t want to befriend a cheerful giver? Nobody. Everyone wants something. However, at times, we can’t help being baffled by a seemingly easy question: What to give on Christmas? Roaming around Wafi City for hours didn’t help me find gifts that match the people I have in mind. 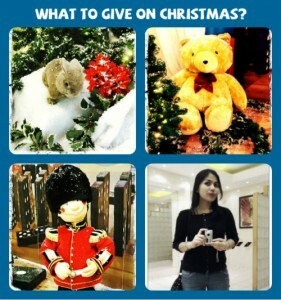 Then I bitterly pondered: “Why giving has to be seasonal?” I can give them something special anytime I want. 1. Sing a lovely/fun/jazzy/feel-good Christmas song. It doesn’t matter if you sing out of tune as long as you sing from the heart. Or you can compensate by dancing and prancing along with the Christmas carol. Hmm.. I won’t ask something I haven’t done. I remember how people used to smile every time I sing a heartfelt yuletide song. 2. Share the best Christmas story you can ever think of. Ideal length would be 300 words. I only care about the characters, plot, quality and delivery. Language can be either English or Tagalog. You’ll be surprised – my eyes and ears are all yours. 3. Tell me a funny tale/joke. Humor breaks ice. Humor destroys boundaries. Humor saves a day from total ruin. But beware: whatever you find laughable represents a bit of yourself. 4. Write me a snail mail or a Christmas card. It’s been years since I have ever received a real hand-written letter. Well, it’s been years since I’ve given one, too. I think it works this way: send one to receive one. The last time I wrote a Christmas card? Oh..college days. 5. Play with me. This is why I think Christmas is always just for kids..like me. Seeing a child or children reminds me of “play“. Chess? Ping pong? Badminton? Cycling? Jackstones? Hula hoop? Teddy Bear Fights? Barbie Dolls? 6. Buy me an ESL Book. Books are treasures to keep and definitely worth sharing. I’m really into demystifying the English language. So if you intend to treat me out for Christmas dinner, save the money for a good ESL book instead. 7. Show sincere appreciation. Stop slandering anyone. Be gentle. Be kind. Sometimes, no gift is better than peacefully blending with others. After all, we were not commanded to give gifts, just to love thy neighbors. How does this become a gift to me? A minute of less hatred and annoyance is equal to 60 seconds of prolonged peace and compassion. If I dug all buried ideas in my head, I wouldn’t afford a decent sleep. Don’t forget to tick at least five items on my wishlist. Good night! Thanks for taking time to read and comment. 🙂 I paid your blog a visit! Ok Issa. I’ll knock out two of your wishes with one rock. The appreciation and kindness thing I always do. And I always have a song in my head. Or on a piano when I have one to play. The two wishes of yours that will come true in one fell swoop, however belatedly (It was you who suggested that these gifts could be given at any time, right? ), is a Christmas story. It was funny then. It is even more so now. My parents are no longer with me, and I’m still a young man. But a fond memory I have is the Christmas of 1992-the last one I would have with my parents together. I’m not sure how familiar you are with American Pop Culture, but there was a show called Married With Children. My mother called this Christmas the Bundy Christmas. The Bundys were the family around whom the show was based. I digress. Rather than wrapping all the presents and putting them under a tree, my mom decided we would give the gifts one at a time using the same wrapping paper. She decided this as it was happening though. It wasn’t as if she made an announcement that she didn’t want to wrap presents, and would therefore breach Christmas protocol. Rather, Christmas just crept up. She wrapped my first present. She brought it out. I opened it without mangling the paper too badly. She went back to wrap another present, but with the wrapping paper in hand from my first present. Before you knew it, she was in the rhythm of just reusing the wrapping paper to crudely cover these presents. Rather than being horrified, my father and I commended her spirit. My mother was very high spirited. Even now, I taste something like a memory. This was my final and most fond Christmas. I don’t remember what the gifts were. Though my parents didn’t die till very recently, they did split after this Christmas, rendering the Bundy Christmas my final Christmas memory.